A small red building stands out on Navigation Boulevard, luring customers inside with the mouthwatering scent of freshly cooked tortillas. Upon entering, the restaurant’s loyal customers see red and white walls decorated with honors and recognitions, one of Houston’s best menus, and, usually, a line. 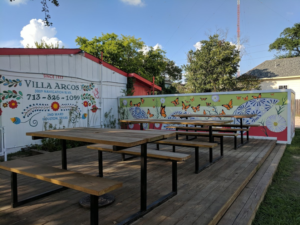 The family-owned restaurant Villa Arcos was established in 1977 by Velia Arcos Rodríguez Durán and continues to thrive today under her family’s care. In 1986 her daughter Yolanda Black Navarro purchased the business and, upon her passing in 2015, it was handed down to her only child, Christian Navarro. A native Houstonian, Yolanda grew up in a two-story house at the corner of Palmer and Navigation Boulevard, next to where Villa Arcos stands today. Childhood memories include bus trips downtown, as well as visiting Wayside and Harrisburg Streets and Settegast Park. Parks offered space for her family’s great Easter celebrations attended by all the aunts, uncles, and cousins on her mother’s side of the family. Although she lived in a time where women, especially minority women, faced many challenges and constraints, Yolanda achieved success her own way. Yolanda attended the University of Houston and graduated in 1973. Though she held several jobs at Texas Employment Commission and Southwestern Bell, she ultimately became a community advocate. 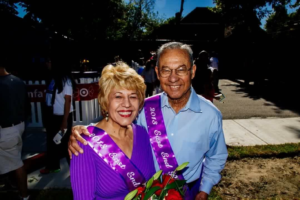 She was a founding member of Association for the Advancement of Mexican Americans (AAMA), she also teamed up with businesses in her neighborhood to create the Navigation Area Business Association (NABA). 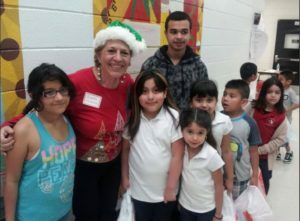 Another way she gave back to her community was through Shoes for Kids, a program that has given more that 30,000 pairs of shoes since its inception. Additionally, she ran for a position as City Council Member twice, although she did not win either time, she mentions that her campaigns were invaluable learning experiences. These are just some of the ways that Yolanda Black Navarro has given back to her community and to Houston. Her actions show us a women that was not only concerned with her community’s well-being but with the well-being of all Houstonians. Yolanda was one woman affecting change for her family, her community, and her city, in addition to the wider history of Latinos in the United States. Just a few decades ago, the idea of a woman like Yolanda—independent, entrepreneurial, educated, politically active, unapologetically Latina American—was difficult, if not impossible, to envision. In many ways she is an example of trailblazing and perseverance, of a person who experienced change firsthand and also drove it. In the simplest terms, she was an everyday person who did extraordinary things, and her legacy in the city of Houston continues to grow. Click in here to access Villa Arcos’s website. Video of Raul Dominguez interviewing Yolanda Black Navarro at Villa Arcos, in November 2010.